William Laman Furniture.Garden.Antiques - Articulated Vase Set; Lg. Accessories → Vases → Articulated Vase Set; Lg. Item No. 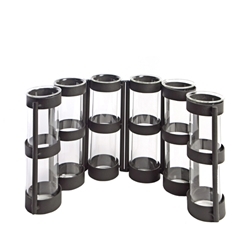 77 Articulated Black metal grid with six large individual test tube vases. Double them up and shape two half rounds into one round centerpiece. Item No. 78 Glass Tube Replacement Vase; Lg.